The BAFS 2014 symposium was a great opportunity to meet hundreds of Business Analysts from France and Switzerland, but also from Canada and USA, as Kevin Brennan introduced the symposium with the new version of BABoK, and Kathleen Hass shared her long experience about complex project management. These are the new horizons of BA : on the downstream side, the synergy with Project Managers, on the upstream side the contribution to value creation ! 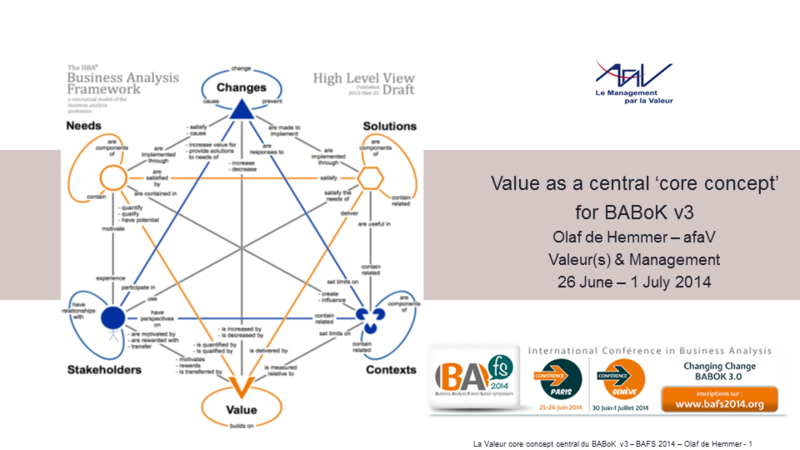 There definitely is room for synergies between Business Analysis and Value Management : will IIBA add a ‘perspective’ to the BABoK v3 ? In any case, we will offer VM training to the BA community, in France, Switzerland and elsewhere ! 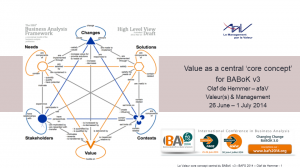 Article précédent : IIBA et Business Analysis à BAFS 2014 : de la Valeur partout !